Your business deserves a place to grow and succeed in a location where families flourish. Strategically located near Virginia’s capital of Richmond and midway between New York and Florida, Henrico positions your business for maximum local, national and global impact. Here’s why over 25,000 businesses call our county home and more are choosing Henrico every day. Enjoy the low costs of the south and market access of the Mid-Atlantic region. 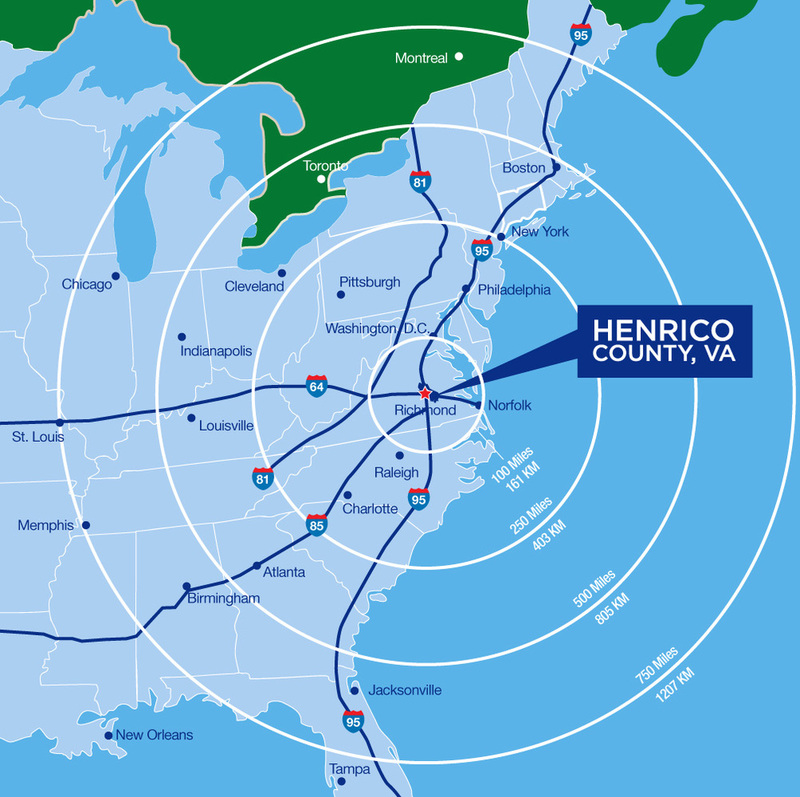 Henrico offers easy access to Richmond International Airport (RIC), commercial and municipal airports, rail and port facilities, and overnight delivery hubs. Henrico County is also intersected by two major interstates, I-95 and I-64, heavily traveled north-south and east-west highway corridors. More than 55% of the U.S. population and major manufacturing sites are located within 750 miles of Henrico County. Tap into a diverse, educated workforce and labor pull of over 670,000 - including graduates from nationally ranked high schools as well as a strong network of community colleges, technical schools, four-year institutions and top graduate schools in business, engineering and health. More than 135M pounds of cargo are handled annually at Richmond International Airport, which is a designated Foreign Trade Zone. We’ve got you covered. Henrico is home to more than 60 diverse foreign-based firms, and we offer competitive advantages for international business and trade. Richmond International Airport is a designated Foreign Trade Zone, and Dulles International Airport – just 110 miles to the north – offers direct service to approximately 50 foreign cities. The Henrico EDA is the central point of contact for all of your relocation or expansion needs. Call us today at 804.501.7654.